Once a concept confined to science fiction novels and futuristic movies, autonomous vehicles are well on their way to becoming a reality―and 2016 was a landmark year for the sector. Tech companies grabbed the lion’s share of the headlines, with a string of announcements that showed the extent to which they are betting on the space. In August, Uber announced the $680m acquisition of Otto, the self-driving trucking company, on the same day that it also unveiled a $300m partnership with Volvo focused on vehicle development and production. In October, Tesla revealed that all of its new vehicles would be equipped with hardware to enable fully-autonomous functionality, and in December, Google disclosed that it was spinning out its self-driving unit into a separate company called Waymo. But automakers have not been sitting idle. In March, General Motors completed the acquisition of Cruise Automation, a startup developing self-driving technology, for a whopping $1 billion―only a few months after it disclosed that it would partner with Lyft to test self-driving taxis. In August, Ford proclaimed that it would mass produce fully-autonomous self-driving vehicles by 2021, and in the same month auto-components giant Delphi announced that it would be providing the Singapore Land Transport Authority with a fleet of self-driving vehicles as well as software for a mobility-on-demand program. The above is just a selection of the multitude of deals, partnerships, and development programs that are continuously springing up related to autonomous vehicles. Driving all this is a recognition that a profound shift is under way in the automotive industry. 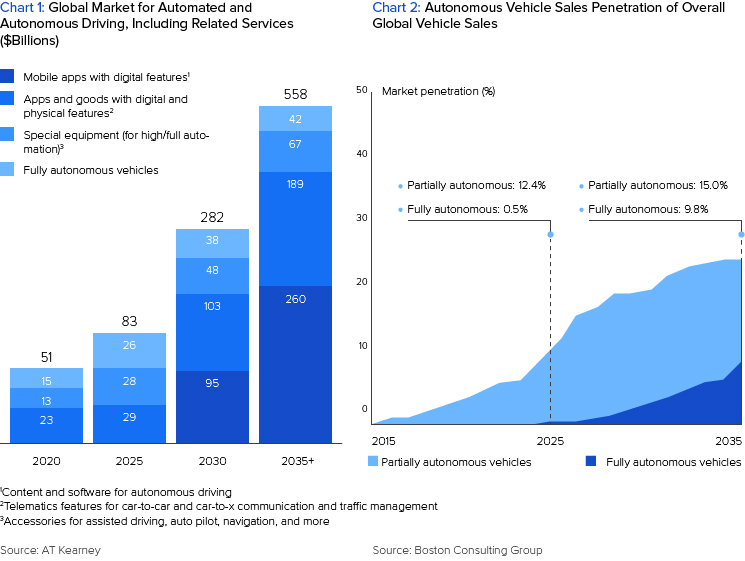 As illustrated by Charts 1 and 2 below, AT Kearney estimates that the market value of the connected mobility marketplace will skyrocket to over $550bn by 2035, while BCG estimates that autonomous or semi-autonomous vehicle sales penetration could reach 25% by the same year. In this rapidly evolving market, how can incumbents react? Existing industry players are well aware that autonomous cars will have a tremendous impact on the mobility market. But how will they change consumer behavior, exactly, and at what pace? What strategies will allow the constituents of the automobile value chain to remain relevant in the long-term? In this article, we analyze how the auto industry will evolve into a software-first sector as autonomous technology progresses, and what considerations can be pursued to reposition for the future. As autonomous technology advances, a profound shift in consumer behaviour will alter the revenue model and value chain of the industry. While the nature of these changes will be multifaceted, at a high level we can categorize them into two principal buckets. The first major change relates to the time spent in vehicles. We already spend an enormous amount of time in our cars: the AAA Foundation estimates that US drivers spend more than 290 hours each year behind the wheel, equating to roughly 6-7 hours per week per licensed driver. But with the advent of autonomous vehicles, this number is likely to increase. As responsibility for control of the car moves to computers, significant demographics that have historically had limited or no engagement with driving―the elderly, people with disabilities, children―will no longer be faced with this constraint. Moreover, as the travel experience becomes more pleasant, consumers will be willing to spend greater amounts of time in their vehicles. Two separate academic studies concluded that autonomous vehicles could lead to increases in vehicle miles travelled (VMT) of up to 20%. Coupled with the above would be an increased amount of idle time spent in vehicles. The logic is straightforward: as cars evolve into self-driving entities, humans will have more time to do other things while travelling. The pace at which this will occur will depend on advances in technology, but as shown in Chart 3, AT Kearney estimates that self-driving technology could free up 1.9 trillion minutes of idle time for passengers by 2030. The other fundamental change in consumer behaviour that will be catalyzed by autonomous vehicles is the rise of mobility-as-a-service (or transportation-as-a-service). Loosely defined, mobility-as-a-service (MAAS) refers to a shift away from personally owned vehicles towards the use of mobility solutions on an on-demand basis. Underlying this trend will be two factors. On the one hand, the last decade has already seen a shift in consumer perception of car ownership away from status symbol and towards utility. 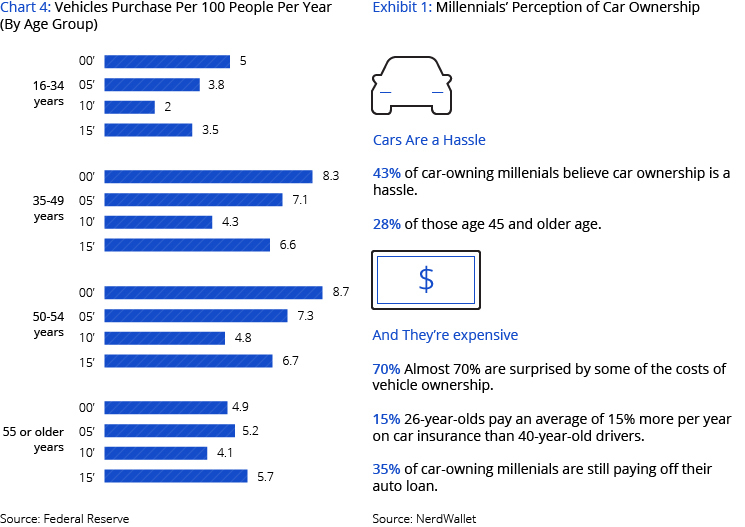 As illustrated in Chart 4 and Exhibit 1 below, car ownership has been waning for several years, likely driven by changing sentiments among younger demographics. In fact, data shows that the percentage of US citizens aged 16-24 holding a driving license declined from 76% in 2000 to 71% in 2013. So autonomous vehicles notwithstanding, advanced economies are witnessing a secular decline in car ownership figures. Self-driving cars will accelerate this trend. Augmenting this trend has been the rapid growth of on-demand ride services (e.g. Uber) as well as car-sharing services (e.g. Zipcar). Membership in car clubs, for instance, is growing at more than 30% per year, and should hit 26m globally by 2020. Recognizing the trend, traditional OEMs like Daimler and BMW have already pushed into this space (with Car2Go and Drive Now). And with the explosive growth of car-hailing applications like Uber, Lyft, and Didi Chuxing, the lines dividing these services are starting to blur. Once drivers are removed from the picture, Uber and Zipcar will essentially become the same service. The confluence of all these factors will continue to drive the MAAS trend going forward. 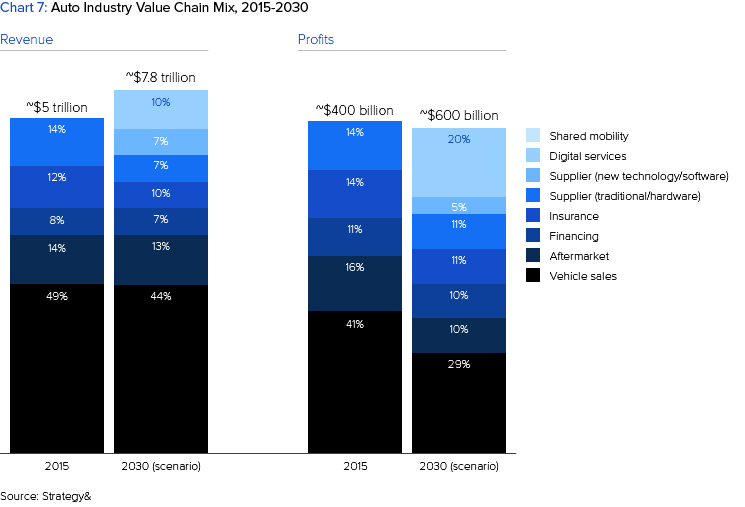 Morgan Stanley estimates that by 2030, growth in vehicle production will have stagnated, while Chart 5 indicates that shared car services will pass 15% of total cars on the road. The result of the above is that a profound shift in the value chain will take place. We are likely to see the industry evolve from an OEM dominated value chain towards a “technology stack” that in many ways resembles what we have seen occur in the PC industry. As Figure 1 shows, the industry is likely to be divided into three principal categories. At the bottom of the stack will be the hardware companies: those actually producing the vehicles and their components and accessories. Sitting on top of these will be the software layer which provides the intelligence that runs the cars, as well as the software enabling connectivity of the vehicles and fleet management functionality. At the top will be the application layer which will leverage the two lower parts of the stack to provide consumers with services and content related to their transportation needs and experience. Accompanying this change in the stack will be a shift in where the value lies. Today, the overwhelming majority (c. 90%) of the value of a car relates to the hardware―the chassis, the powertrain, interior seating and lighting―but the new paradigm described above means that differentiation and profits will migrate towards the higher parts of the stack. 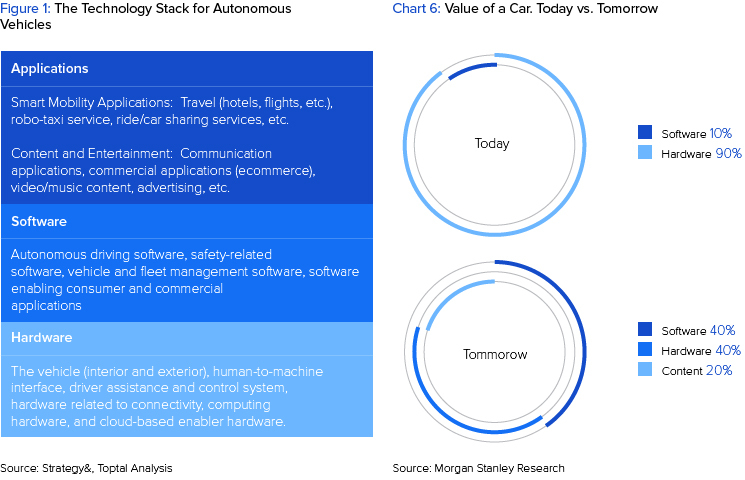 In Chart 6 above, Morgan Stanley estimates that the software and applications layers will collectively account for 60% of the value of a future self-driving car. More significant is the fact that these software and application focused layers are also higher margin businesses. A study by Strategy& found that while revenue share for hardware suppliers will decline, their share of industry profits will decline far more substantially (Chart 7). The implications of these developments are clear: for industry incumbents to stay relevant, they must not only recognize the unfolding shift, but act accordingly to position themselves in the evolving landscape. Faced with the prospect of long term decline, OEMs who enter new layers of the value chain (software and/or applications) will continue to be relevant in the industry of tomorrow. But how can they do this? Below we dive into a few important considerations to keep in mind. The first key consideration relates to which other layers in the stack traditional players can participate in. On the one hand, it goes without saying that whichever of the two one chooses, fundamental reconsiderations of corporate structure and priorities will need to occur. Moving from being a supplier and producer of automobiles and auto-components to being a software company is a tectonic shift to say the least. But assuming this can be done, where does it make most sense for OEMs to angle into? Our view is that much like the PC and smartphone industry, the car of tomorrow’s operating system will be dominated by one or two providers. Network effects ensure that these layers in the stack tend to be a winner-takes-all market. And frankly speaking, it feels difficult to envision a car company winning out in this race. More likely, one of the traditional technology companies will emerge as the principal operating system. With this in mind, our recommendation would be to work closely with all the technology companies developing on operating systems solutions to ensure that the hardware/software integration is as smooth as possible. This will in turn drive sales of the hardware, which will remain the core competency for many years to come. In the meantime, we would encourage current industry incumbents to think ahead on what types of applications consumers will find most useful and to position themselves and start developing these accordingly. The other key consideration relates to how these strategies should be executed. Borrowing from the technology industry’s playbook, should OEMs aim to be Apple―a company that owns the entire chain from hardware, to software, through to the point-of-sale―or should they be an Android/Microsoft which focus on the operating system and integrate into hardware and retail distribution provided by other companies? The two strategies are fundamentally different and have massive implications. 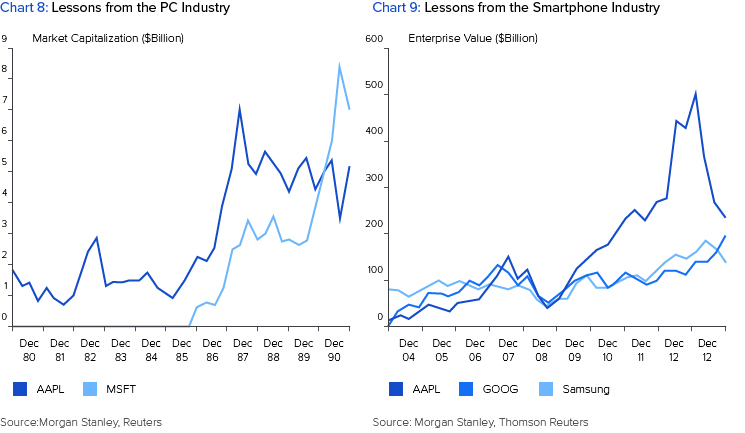 And the problem is that the evidence from the PC and smartphone industries doesn’t help solve the dilemma. On the one hand, in the PC industry, Apple led the way, but more open systems quickly caught up and eventually took the lead (Chart 8). In the smartphone industry we’ve seen a different set of events unfold. Open systems like Android dominate in terms of volume, but Apple continues to lead the way in profits (Chart 9). Our gut tells us that open systems are probably the safer bet. Building a fully integrated car will most likely revolve around the operating system, which current technology giants are best positioned to produce. Aside from M&A, we don’t envision current OEMs being able to effectively transform themselves into technology-first companies. Rather, our suggestion would be to embrace the more open-ended approach and follow a dual strategy of hardware optimization on the one hand, and application development on the other. Whichever strategy one chooses, the critical component for success is effective talent sourcing and management. The players who attract the best talent and structure their organizations to maximize innovation will be the winners in this space. But competition for talent has already heated up, and reports of defections and lavish compensation packages are not uncommon. One suggestion is to establish numerous partnerships with exciting startups as a way to achieve the twin goals of investing in promising technology and developing insights into the quality of the teams in question. As these partnerships evolve and the winning teams start to pull ahead, organizations can employ M&A to bring these teams in-house. Incumbents can use this tactic and others to attract self-driving talent―but the first step for stakeholders is understanding the changes in the automotive landscape that we have outlined above, and committing to a strategic realignment that will help them stay relevant well into the next phase of vehicular transportation.